Take the time to learn how to build a brick patio. Once the job is complete, your home will be more appealing, your back yard more functional and you'll have a sense of pride knowing that as you sit on your beautiful brick patio, you did it all by yourself. Make sure you have an idea of exactly what you're going to be doing and how big the final patio will be. If you've never built a brick patio before, it's recommended you keep your patio square or rectangle in shape so the installation will go much smoother than trying to install a curved patio design. Measure out the space allotted for your patio and hammer a piece of 2x2 planking into the ground at each corner. Measure diagonally from corner to corner to make sure the design is even, then rope off the area with string or rope so you know where to keep your shoveling limited to. Take a spade and cut into the ground all along the edges of the design, then use the digging shovel to excavate the area to a depth of about eight inches. If you are building the patio away from the house and in the yard, the ground should be completely level all the way around. If you are building the patio as an extension from the house, gradually grade the ground at a slope of a quarter-inch per running foot away from the house so water will run away from the house and not pool up against the foundation. Place bricks on end, shoulder to shoulder along the perimeter of the excavated area to form a bricked edge all the way around it. Tap each brick with a rubber mallet to set them in place. Pour about four inches of crushed stone into the excavated area and remember to keep true to your gradient if the patio is up against the house. Use a heavy tamping tool to tamp the crushed stone down. Cover the layer of crushed stone with landscape fabric to prevent weeds from growing up through the bricks. Cover the landscape fabric with two inches of clean sand and use the level 2X4 planking to level the sand. After the sand is smoothed out, tamp it down and remember the gradient! There should now be two inches between the layer of sand and the top of the brick border. There are a number of ways to lay the paving bricks from staggering the ends to a basket weave design. Laying them in a basket weave design is one of the fastest ways to get your patio built as this method does not require any bricks to be cut. If you go with the staggered approach, you will have to start every other row out with a half brick, which will increase your time on the job. 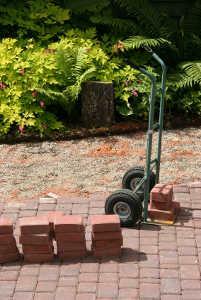 To create a basket weave pattern, lay two bricks horizontally with one brick beside the other. Lay the next pair of bricks in the row shoulder to shoulder, or vertically. Alternate this sequence to finish out the row. Start the next row with two bricks laid vertically, followed by two bricks laid horizontally and so on. As you lay the bricks, tap on each one with a rubber mallet to set them in place. Avoid kneeling on the set bricks when installing the remainder of the bricks. Lay a piece of plywood on the sand and kneel on it instead. Once the bricks are all laid, spread some sand over the patio, use a broom to sweep the sand into the gaps between the bricks and lightly spray the patio with water from a hose. This will allow the sand to settle and help to stabilize the entire structure. If the sand settles too much after watering, add more sand and repeat the process until the cracks are completely filled. Gather up a few friends and plan a weekend to build your new patio. The job will take the better part of a day once you have all the materials on the site, so plan to start early. By evening you'll be able to fire up the barbeque and enjoy a nice cold beverage on your brand new brick patio.